Regardless whether you like or voted for the man, the newly elected US President, Donald Trump, is a proven leader in the business world. He will now be tested as to how effective he will be as a leader in the political realm. I suspect he will do fine and even blossom. I learned that he will attend a pre-Inauguration morning prayer service in which a Christian pastor will present a brief sermon focused on Nehemiah, an Old Testament hero/leader of the Hebrew nation. It’s a fascinating subject choice with interesting parallels. Nehemiah was a Jewish man of good standing and influence in the high court of King Artaxerxes of Persia in 445 B.C. As cupbearer to the king, his rank, stature, and likely wealth would have made leaving his life in Persia a personal sacrifice. Yet he aches for his homeland and upon hearing about the deplorable conditions among his people in Jerusalem, he asks the king for an extended absence to travel there to help. 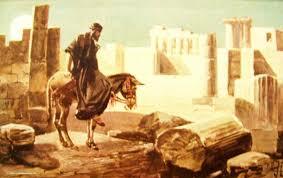 Because he had the complete confidence of the king, Nehemiah is able to return to Jerusalem. And he goes with the full endorsement and a governor’s commission from the king to rebuild the ruined walls around the city, ensuring its security and protection from outside invaders and unifying a demoralized city and nation. As an intelligent and bold leader, Nehemiah surveys the situation and then devises a practical solution involving spiritual devotion and pragmatic execution. He then rallies and sells it to his constituents. From a standing start, Nehemiah mobilizes and efficiently organizes the Jews into groups to rebuild the walls. This is done in the face of mocking, ridicule and opposition in and around Jerusalem. While overseeing the rebuilding program, Nehemiah also resolved social issues involving unfair lending practices and interest charges and slavery within the Jewish community (Chapter 5). And when the walls were completed, Nehemiah took part, with Ezra, in a celebration at which the Law (Torah – first 5 books of the Old Testament) was read and the Festival of Tabernacles (Booths) was observed for seven days, during which the Jews confessed their sins (Chapter 8). Then he, as Governor now, dedicated the wall and led a ceremony of covenant renewal in which the people rededicated themselves to God and to observing the Mosaic law (Chapter 9). These are a definition and model that certainly apply to Nehemiah as well as any successful modern business and political leader. So while many may remain skeptical, I have little doubt that our new political leader will bring this revived breath and breadth of leadership to the nation. Certainly not without challenges, opposition, and difficult obstacles. And for that we can pray with him, for him and this nation, to unify, restore, and rededicate ourselves to our nation and common Creator and Giver of Life. But trust that it will not be his leadership gifts, strengths and prowess that will be the key to his successful administration; it will be his humble acknowledgment and submission to God. Just like “President” Nehemiah in his day. How are you praying for your new President? Mike, I love your biblical viewpoints and I try to read them all when I can. I have to say that this was the hardest one I’ve had to read (and maybe its because I am still struggling) because I find it hard to accept Trump as our commander-in-chief. For so many years president Donald Trump has represented a leader after his own self-interest, making money off of the backs of the poor and desperate. Pocketing money that small business owners could have used to propel them back into the economy and sending countless of people in debt from his many casinos and over consuming natural resources to build hotels and golf courses. Let me get this straight, I definitely believe in the best of what president Trump can do, but thats only because I believe that Jesus “sets the government on His shoulders…” just like He has with every administration before Trump’s. But I need serious prayer because there hasn’t been one thing said that I have found convincing enough to point our nation towards Jesus and or economic prosperity…and thats a big deal for me as a citizen. Also, I have struggled with the story of Samson and Delilah lately. I don’t know why, but I do believe that much like in the book of Revelation, we can allow spirits to come up against us just like the 7 churches. I know former president Obama and his administration forced the issue on some things that should have been left to the people; however, “For the love of money is the root of all evil: which while some coveted after, they have erred from the faith, and pierced themselves through with many sorrows.” I have never heard of an American president focused on money that he can not even divest his business ventures to a 3rd party like the people have asked. I don’t know, I am really trying to give Trump a chance, but I love this country so much and as a student of history, although I know our empire will eventually fall, I am just waiting to see if president Trump has our interest in his forsight or if he has his own. So far, NOT so good!!!!! !